Cloud computing technology has greatly influenced the way organizations store their information and statistics. The adoption of cloud-based technologies has reduced data storage concerns of enterprises, allowing them to concentrate on their core capabilities. However, concerns pertaining to the privacy of sensitive data and frequent security breaches are major factors crafting the need for cloud security solutions. Thus, cloud access security brokers (CASB) are achieving a vital position in the cloud security domain as protectors of organizations’ critical data. The global CASB market is expected to expand at a CAGR of 16.7% from 2016 to 2024 owing to extensive deployment by a large number of small and medium-sized businesses (SMBs). This large-scale deployment can be attributed to the flexible characteristics of CASB solutions. The CASB market is segmented on the basis of cloud deployment type, components, services and geography. The market’s component segmentation comprises software and services. Software-based CASBs include cloud-based and on-premise types encompassing the following solutions: control & monitoring, risk & compliance management, cloud data encryption, data leakage prevention, and tokenization. The services delivered through CASB products include consulting, system integration, and operation & maintenance. CASB deployment across SaaS platforms has witnessed a large number of implementations, owing to rising trends in SaaS-delivered services and its cost-effectiveness. North America recorded the greatest implementation of CASB services since their inception, and the region is expected to dominate the CASB market at the highest CAGR of 18.4% from 2016 to 2024. This high growth rate is anticipated due to the expansion of cloud-enabled services across the U.S. Moreover, rising awareness in cloud security has further strengthened the market for CASB services in North America. Market players profiled in the report are mostly start-ups with highly innovative technologies and methodologies to secure data over the cloud. Key players in the CASB market include NetSkope Inc., Skyhigh Networks, CloudLock Inc., Zscaler, Inc., Adallom, Inc., Bitglass, Inc., CipherCloud Inc., and Protegrity USA, Inc. Cloud access security brokers are primarily deployed to protect the critical data of organizations. The advent of cloud-based systems has helped many companies to manage their critical data in better ways. Lack of information storage infrastructure has led the small and medium businesses to acquire cloud services. The rising data breach and data leakage incidences on the internet have led to the rising demand for cloud access security brokers in many regions. Cloud access security brokers offer solutions to data controlling and monitoring, cloud data encryption, tokenization, risk and compliance management, and data leakage prevention. The involvement of a large number of small-scale and medium-scale companies, the entry of new companies, and the presence of many leading companies will drive the global market for cloud access security brokers. The global cloud access security brokers market is predicted to reach US$13,218.5 mn by 2024, expected to exhibit a 16.70% CAGR during the period between 2016 and 2024. The report uses industry-standard tools such as SWOT analysis tool and Porter’s five force analysis to measure the strengths, weaknesses, opportunities, and threats of the global cloud access security brokers market. For a detailed analysis, the analysts have divided the global market into segments and sub-segments. Key players operating in the global market are also listed in the report. Recent trends, developments in cloud-based systems, and the future growth opportunities are highlighted in the report. Cloud services have influenced many companies operating in various industries. The adoption of cloud technologies has helped many industries to solve their data storage problems cost-effectively. This has allowed the companies to focus on their core operations and capacities. Cloud access security brokers are consistently achieving an important position in the global cloud-based technologies market. By component, the global cloud access security brokers market is classified into service and software. The software segment is sub-segmented into on-premise and cloud-based components. The service segment is sub-divided into system integration, consulting, and operations and management. Although the global cloud access security brokers market is set for a significant growth, it is expected to be hampered by a few factors. Lack of awareness about the latest cloud access security solutions is predicted to hamper the growth of the global market. 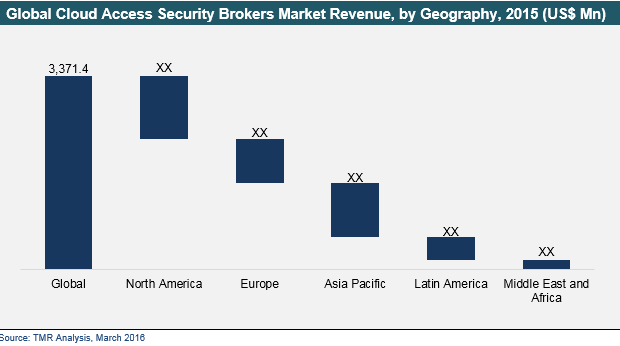 Based on region, the global cloud access security brokers market is divided into North America, Europe, Asia Pacific, Latin America, and the Middle East and Africa. In 2015, North America dominated the global cloud access security brokers market. The North America cloud access security brokers market recorded the highest implementation of cloud access security brokers in the recent years. The North America cloud access security brokers market is likely to exhibit an 18.40% CAGR from 2016 to 2024. NetSkope Inc., CloudLock Inc., Adallom, Inc., CipherCloud Inc., Skyhigh Networks, Zscaler, Inc., Bitglass, Inc., and Protegrity USA, Inc. are some of the leading companies operating in the global cloud access security brokers market. Key companies are aiming to adopt new innovative methodologies and technologies to secure information over the cloud. The entry of new companies is expected to make the global market highly competitive.